Navigating the publishing world as unpublished author can sometimes feel like you are on a solo mountain expedition, without a map or a guide, naively trying to reach the summit without any equipment. The problem is you don’t know what you don’t know. How do you know who to turn to for advice on how to finish the novel you’ve secretly started? What do you do if you get stuck? What kind of support and training is out there? What skills might you need to be successful? What happens once the story is written? What then? How do you decide which publishing route is right for you? Of course, you can find answers to most of these questions by scouring the internet or asking friends – if you are lucky enough to know anyone in the industry – or join a group like The Writers’ Pod, where you can learn from trusted fellow writers and their collective knowledge. As The Writers’ Pod founder and coach, I am on a mission to support other writers in search of answers to these questions. By interviewing industry professionals and authors I have encountered on my own journey to publication, I am able to share their insights with anyone whose writing ambition has fallen down a glacier or been buried by an avalanche of advice. 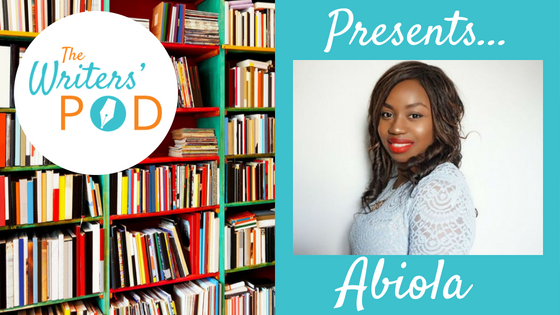 Let me introduce Abiola Bello, the worthy recipient of a 2018 London Book Fair Trailblazer award, championing inclusivity and diversity both in the sector and with the protagonists of the stories she writes. She is the co-founder of The Author School and the indie publisher, Hashtag Press, and passionately provides honest and supportive advice for authors. At the same time, she herself is a children’s/YA published Author, currently working on her third novel. We first met at the London Book Fair in March 2018, where I experienced her enthusiastic support first hand. Abi then kindly took time out of her busy schedule to meet me for her Writers’ Pod Presents interview at a central London coffee shop. You run two businesses with your business partner, Helen Lewis, The Author School and Hashtag Press. Tell me how these ventures came about. We first founded The Author School in 2015. Helen brought her experience as a book publicist and journalist, together with mine as a children’s/YA author. We had both spotted a need to support writers on their journey to publication. The idea was pitched for the Virgin Start-up scheme and we came together to make it happen. We’ve run everything from full day courses with industry speakers to informal networking events and from workshops to one-to one sessions. The business is evolving all the time but the common themes in everything we do are to give our authors accurate guidance, with a genuine desire to see them succeed. More recently, after several of our authors had asked whether we would help them get published, the idea for Hashtag Press was born. It wasn’t an overnight decision; neither of us were under the illusion it would be easy. Again though, after several months of discussion we recognised the need for some books and authors to be given a chance to thrive, using a different model. Sometimes the deal an author is offered via the traditional route isn’t quite right for them. We offer the skills and industry expertise of the traditional publisher combined with more of the creative freedom of the self-publishing route. Focusing on Hashtag press first, how do you decide who to work with? First, I put my money where my mouth is and we published my book. We work with authors who know us and trust we will look after them and their books. One of our first authors chose to publish with us because she shared our values and vision. We do accept direct submissions (see instructions on website) although we need to be selective. To able to support the book and the author, the project has to be one we are passionate about and that we believe will generate interest/sales. What ambitions do you have for Hashtag Press? Our aim is to produce beautiful books, providing our authors with a platform for their future successes. Eventually, we hope to evolve the business into a traditional publishing house. Once you’ve taken on a book, what happens next? We help the author find the right editor and work with them on the editors notes to help polish the manuscript. We identify/introduce them to cover artists/illustrators. At the same time, we talk to foreign rights departments and pitch to bookstores ahead of publication to gauge interest. Helen works on the PR and press whilst I tend to coordinate contact with bloggers, reviewers and selling the rights. There is usually a process of at least 4 more edits for formatting, typesetting and proofing. The publication process is a collaboration between us and the author. They will invest in the production costs (Editing/cover design etc) which they may outsource themselves, and we invest our time. The contract is 50:50 profits for printed books, 60:40 for e-books. We contribute our social media marketing expertise and promotional work through festivals/ bloggers/ bookstores as part of the contract. Initial PR will determine interest in the project and the size of first print run. Often the first print will sell on pre-orders. There seems to be an upwards trend in success for the smaller independent publishers. Why do think that might be? Publishing is an extremely competitive business. The big five publishers must find books and authors which they believe are likely to sell in large enough volumes to warrant their investment and cover their extensive cost bases. For an unknown author this can feel like a machine. Smaller publishing houses can be more flexible and have the time to invest in the people and the books they feel have potential. What advice would you give a writer once they have finished their manuscript? As a first step find an editor and have it professionally edited. You need to elevate your book to be as strong as possible and give yourself the best chance of getting published. Look at the books in your genre. Often the editors will be credited in the acknowledgements. Or you can approach the Society for Editors and Proof-readers (SfEP.) Your decision will depend on their availability, reputation and cost. It is an important relationship, like any other service, and you will need to feel comfortable working with them, so choose carefully. Do you have any other advice from one author to another? Write in a detached way! Be accepting of the commercial nature of the industry. If you want to maximise your readership, you need to listen to professional advice and not be too precious about your creative output. That’s not to say you should be swayed by every opinion. Some of the most successful authors were rejected many times yet followed their instincts and came good in the end. If you disagree with feedback talk it over. You will know when to make changes and when to follow your instinct, but remember you asked for their thoughts for a reason. Talking of advice, what’s happening next at the Author School? Following the sell-out summer session, ‘An Afternoon with the Author School’ in July 2013, tickets are now available for our next exciting event. This September 21st we are hosting, ‘Cocktails and Conversations with the Author School.’ Topics for discussion will include the publishing process, PR and marketing and the author journey. The evening is limited to a select number to enable relevant tailored advice to those writers attending and a follow up one-to-one is included in the price! We are also doing our next full day on November 12th with guest speakers. A few that are already confirmed are Phoebe Morgan, author of The Doll House and Aimee Felone, co-director of Knights Of. If you are interested in joining the Writers’ Pod coached group, sign up here for details of Early Bird offers coming soon!